There are 5 key ingredients to any successful Super Bowl watch party – Food. Drinks. Seating. TV. Decorations. 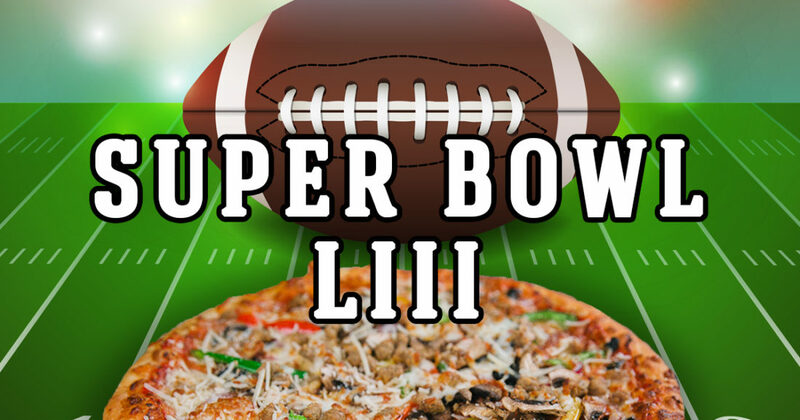 If you are planning on throwing a watch party for Super Bowl LIII, it is easy to make it a success, as long as you cover the basics. Everyone who has ever hosted a party can tell you, the most important thing is the food you provide. Lucky for you, Palio’s pizza pairs perfectly with football games. So, if you are having a group of people over to watch the game, make sure you have plenty of Palio’s on hand to feed them all. We’d also recommend having some snacks: chips, pretzels, and candy on hand too! For everyone 21 and over, beer is a clear staple when watching football. It is great to have other drinks on hand, though. Try a signature cocktail or alcoholic punch for those that don’t like beer and maybe alcohol-free lemonade and sodas for those that don’t drink at all. Don’t worry about the presentation on drinks, just make sure they are cool and there is plenty of ice to last the length of the game. You want to make sure you have enough space to accommodate the number of guests you’ve invited. Depending on the size, not everyone may be seated at the same time, but you want to make sure you have options for them. Having a few extra throw pillows on hand to serve as seating is an easy way to avoid making someone feel like they have to stand. Size may not matter a whole lot, but it does help to have a screen big enough for everyone to view. If the purpose of the gathering is to watch the game, you want to make sure everyone can see the action. This may require you to reposition your TV from its normal spot. Before the party starts, just think about every angle where people will be and decide where is best to place the TV. While they are not needed for every watch party, the Super Bowl could use with a little sports and team-themed decorations. Try including colors and stuff from both teams, especially if those coming to the party may be rooting for opposing teams. It is always fun to play up the rivalries. While there are no real rules for hosting a Super Bowl watch party, these 5 things are pretty essential to everyone in attendance having fun. Most importantly, these are all easy things to throw together. You can stick to the basics of each of these 5 things and have a great time or you can also go all out on providing these 5 things and really elevate your party. Keep in mind who your guests are and what they’ll expect and you should have an overall amazing time! Place your Palio’s Pizza order in time for delivery.